Also the viewer brings his own perception and interpretation into the game As a photographer you chose between visualizing what you call “the truth“ the best you can. Or: you entertain the viewer with a fictional story, wether to enhance or hide a “boring” version of the truth, making them feel strong emotions on the way. The viewer tends to overlook the involuntary power of the portraying artist. It is easy to trust your optical sense (because you are obligated to in order to survive) and ‘believe‘ the optical facts. The reflection progress afterwards is necessary – but occasionally not critical enough. Roughly mentioned: there are a lot of things that complicate the (not so!) simple task of portraiture! I felt I had to explore this field more. I knew Martin for a long time, but not too well. He is an actor, literature worshipper and a wonderful, kind, loving soul. Sometimes it felt like life must have played too rough with him and yet he managed to stay a warm, greater good seeking heart. He reminded me so much of a character in a painting that followed me through childhood. I worship Spitzwegs attitude highly: witty, humorous, sharp and truthful – and I felt like Martin has the same, sharp sense of humor in the way he acts, attends lectures and serves his audience on stage. 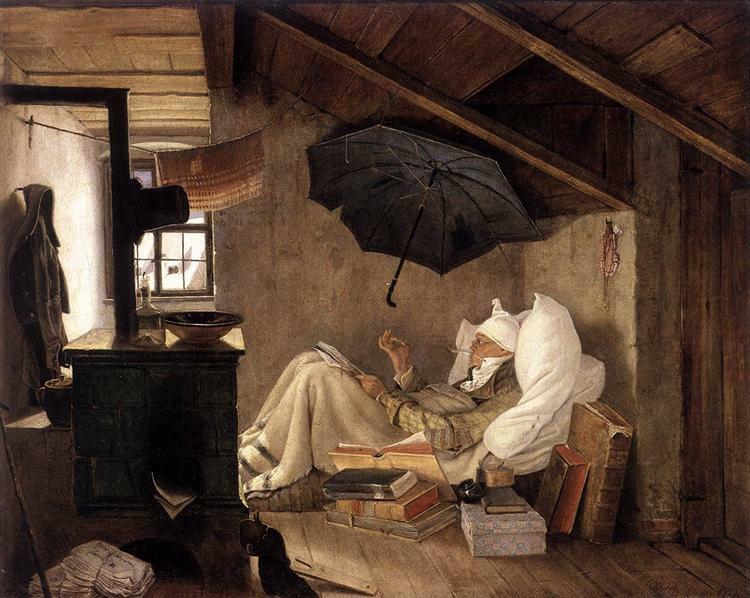 Carl Spitzweg (1808-1885) was a not-so-famous German painter of the Biedermeier era; he painted a lot of humoresque portraits of ordinary people in his time. He was exceptional, painting with wit and hidden meanings many odd attributes of them – and dares us to associate with their character traits. His art is strongly narrative and yet intimate – in a very cinematic, detailed way. I grew up with cheap art prints hanging around many people’s homes in my child hood – even those kind of staid, conservative households the paintings tease. For me those two felt strongly connected in mind and soul. I had to re-connect them visually. In my home town city Bamberg (Bavaria), some town houses remained for longer than a century. Old attics, alleys full of nooks and crannies, crooked and rusty: it is a very romantic town. 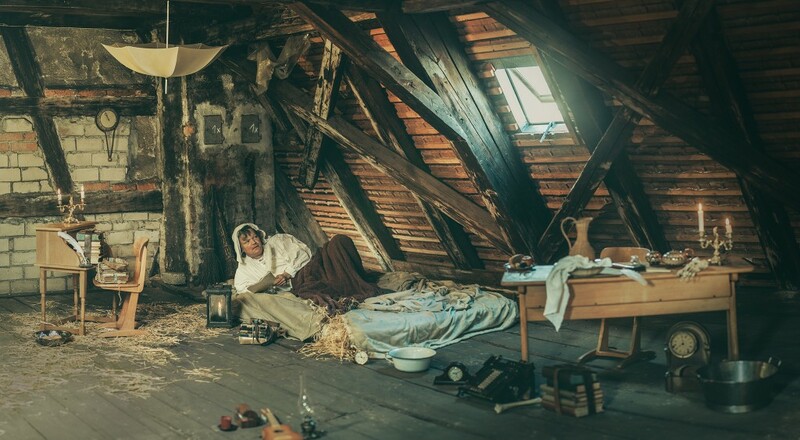 I found an old attic, big and sooty – the local theater and a few friends lent me a lot of props. Back then, this was my first staged project. 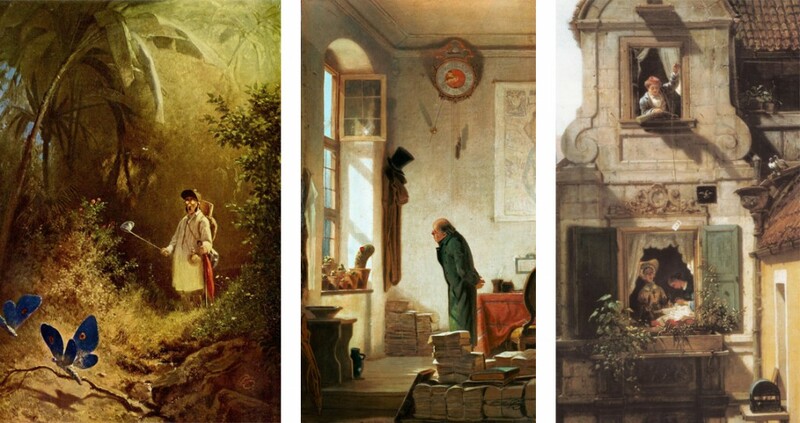 Of course, not all items are historically correct, but were chosen intentionally to create a humorous, pseudo-serious feeling to honor Spitzweg. 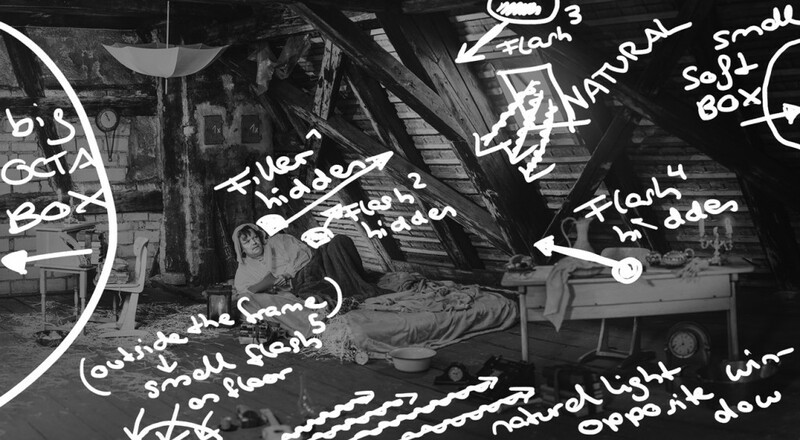 Also more than 7 flashes were hidden in the set to light all objects in the dark attic. It was a lot of dragging and pulling, shoving boxes full of stuff up a latter and many hours of preparation. My lungs must have been black with soot after that day, but it was all worth it. I have had only few chances of collaborating with actors before that day. I was used to directing unexperienced people, telling them a story before-hand and encourage them throughout the shoot. With him, no help was necessary. I was amazed by the improvised stage play. If you cannot distinguish someone’s acting from real actions – it has be good. And I think I am quite trained to see ‘fake‘ acting in front of the lens. He sneezed, scribbled, run fingers through his hair, talked to a skull like noone was listening, nearly burned a feather while playing with the candles – and looked just like any artist must feel like while struggeling to achieve something great. It truly speaks for his profressional attitude to take a photographer as serious as an audience. He never slipped out of his role while shooting. The final image: A wide-angle shot featuring composition, model and room at the same time. As result I chose one carefully retouched frame. It felt wrong to handle the project like shoots before: the story was aught to honor the idealism of paintings – of one painting. Even if it was painful to chose. To me, the frame includes also a lot of space – around the subject and a distance to the viewer. It might be superficial, but I believe people subconscious feel that space. They are obviously – outside. Far away from the subject, even if they are ‘in’ the room. The objects in the room give hints on the poets life – and create the story. In this case it is the ‘bigger picture’ – which strives to have as much impact as a close up. Aftermath: while working with Martin, it was difficult to separate the private person from the professional actor. But on some magical level both blend in together smoothly. The actor, the man, together with the setting and the story that came with it. To me, suddenly the portrait felt more real than a lot of other images I’ve taken before of other people (that are not me). I can always only guess what’s behind the face. But I suddenly gained the ability to show the audience his ‘space’, his surrounding and a story. That story is still fictional and “untrue”, but maybe it creates similar emotions or parallels to the portrayed person… and so the person became true. Yet, beware. I know, it is dangerous to create worlds and stories with my own rules. I must remember that there are a lot of truths I am digging in. Because everybody has their own. I am getting experience all the time by reading such good posts.